Leading Manufacturer of spiral staircase, ms spiral staircase and ms staircase from Ahmedabad. We are involved in offering a wide range of M.S. 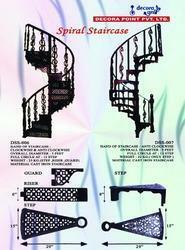 cast iron spiral staircase to our most valued clients. We offer our range at most affordable prices. Our range is widely appreciated by our clients which are situated all round the nation. With the help of our skillful personnel and a qualified team, we are capable of manufacturing, supplying the best quality sturdy range of .S. cast iron spiral staircase. Spiral Stairs offer a unique touch for homes, COMERCIALS, lofts, outdoor living spaces and more. Curved stairs are perfect for adding style to the entrance of your home or making a statement in a lobby area. 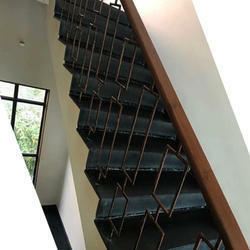 DPPL has designed, built, and delivered the finest all-welded single piece spiral stairs and curved stairs. Whether you're a builder, contractor, or homeowner - we will work with you to design and manufacture the perfect staircase that best fits your needs. Our stairs are engineered to provide easy installation and assemblance. We custom build all of our products to fit your exact specifications. All of our spiral stairs are welded. Additionally, we offer metal fabrication services including shearing, press brake bending, laser cutting, steel plate rolling (up to 1/2"), saw cutting and more.